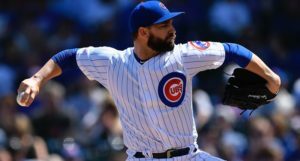 On April 16, 2016, the Chicago Cubs hosted the Colorado Rockies at Wrigley Field … and promptly beat their butts by a final score of 6-2 in a tidy 2 hours and 39 minutes. Ah, 2016 … when everything was perfect. Until today, that game wasn’t especially meaningful or noteworthy – it was but 1 of 103 glorious wins that season – but now we do have at least have one reason to revisit it. Well, two actually: a couple of minor league signings from the Rockies. Leading off for Colorado that day was shortstop Christhian Adames, who had his busiest and best big league season that year, though that’s an extremely relative statement (51 wRC+, poor defensive metrics). And toeing the rubber for the Rockies was right-hander Christian Bergman, who was making his only start of a very forgettable season (8.39 ERA in 24.2 IP). Both are now Chicago Cubs. Wild, right? Adames, now 27, spent 2017 with the Rockies, as well, before moving onto the Marlins in 2018. He took roughly 500 PAs in their Triple-A system last year, but managed only a .269/.324/.370 slash line. It’s fair to say he will probably never be a consistently average or better Major League hitter. BUT MAYBE he could provide some quality defense as a super-duper-extreme depth glove man? 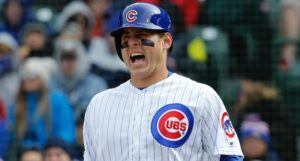 The Cubs have a number of players they’d like try before giving him any shot in Chicago – indeed, as far as I can tell, Adames is not even an obvious defensive-first guy – but I guess you need these types of players around just in case (in case in case). Bergman, meanwhile, spent 2017 and 2018 with the Mariners. He made eight starts and five relief appearances with them in his first year (54.0 IP, 5.00 ERA), and just two starts and one relief appearance in the big leagues last year (14.0 IP, 5.79 ERA). His results at AAA weren’t any better. Bergman doesn’t strike batters out, has good but not excellent control, has an upper-80s MPH fastball, a bad ground ball rate, mediocre contact data, and I really don’t know what else to say. He got a lot of pop-ups at AAA? 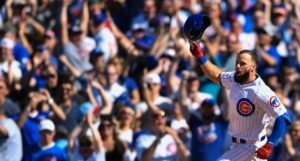 It strikes me as very unlikely you’ll ever see either player in the big leagues for the Cubs. Usually, when the Cubs make Minor League signings like this, there is at least one obvious reason the player is worth having. Some long-shot ability that, if everything else turned up, could make him useful. In this case, I think these are nothing more than *extreme* depth, see what they look like in Spring Training types. But, hey, now that they’re Cubs, I obviously wish them the best of luck and hope they absolutely explode on the strength of One Weird Trick that turns it all around. And if you’re looking for a little fun, here’s the Enhanced Box Score from that contest – Jake Arrieta had an excellent day, plus Anthony Rizzo, Jorge Soler, and Dexter Fowler went deep. See? It’s still a fun post.